2013 was a big year for White Mystery: They toured both the States and Europe, wrote and recorded Telepathic while on the road and even made a few music videos along the way. 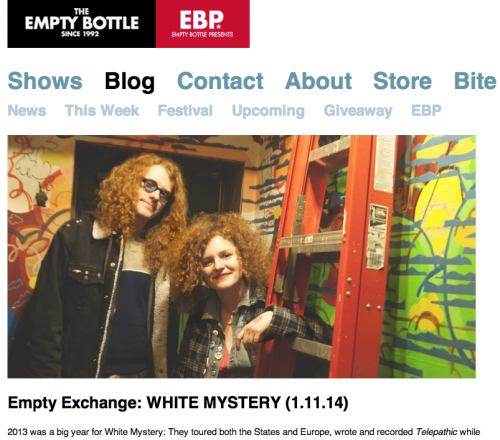 Despite all of this, White Mystery shows no signs of slowing down. After spending New Years Eve playing alongside Roky Erickson, being added to this years SXSW official line-up and having already written the music for their annual 4/20 release date, it’s safe to say that White Mystery is starting 2014 off even stronger. Seeing White Mystery for the first time circa 2010 in Athens, Ohio was electrifying and now three years later White Mystery has all but perfected that alien, 60′s-influenced, garage rock sound. Saturday I got to reunite with the old rock and roll pals and snug as bugs on a pretty dirty couch in the Empty Bottle’s basement I got to hear what writing an album on tour is like, how growing up in a city like Chicago affected their sound today, and where the hell they found that psychedelic bus for “People Power” music video. ASHLEIGH DYE: So you guys both have been playing music for quite some time, since your early teens. You specifically, Alex, started playing in bands when you were 13 and even started a record label in high school. Why do you guys think you were so musically charged at such an early age? You’ve cited inspirations you’ve had but it’s a totally different story to be so active so young. ALEX WHITE: Well, two things stick out. One is that our parents loved really great rock music so we had access to their record collection and fell in love with Zeppelin and The Stones at an early age. The second is growing up in a city like Chicago, where so many great bands play and all the access to great shows really inspires you. Thirdly, everyone has something inside them that is their passion that inspires them. For some people its art or writing and, ya know, we must have had something inside of us that inspired us to play music. AD: You guys were lucky to find it at such an early age. Speaking of growing up in Chicago, your home seemed like it was very liberal. Your mother’s photos of the Disco Demolition and Gay Pride and strangers on the CTA are stunning! I loved going through them. How do you think her photography and aesthetic affected your sound growing up? AW: She was here tonight! She saw me DJ for the first time. AW: Usually we DJ from like 10-4am so she can’t make it out to those, so that was cool. But she’s got a great eye. It’s cool that she was a photographer and not a musician so she had that whole visual aspect. I’m sort of glad we – my family – are all different instead of her being a musician and us being musicians because we can help each other and collaborate creatively. Our youngest brother, Nick White, does fashion, so we get to wear his clothes. It’s a creative family and we all collaborate. It’s really fun. AD: You briefly mentioned this earlier but you said something during an interview with Psychedelic Baby Magazineabout the CTA allowing you to fall in love with rock & roll. This really struck me because having only lived in small towns before living here I spend a lot of time thinking about how kids in the city get to utilize public transportation and all the culture around them. What else, aside from the abundance of transit and rock shows, did you really appreciate about growing up in Chicago? FRANCIS WHITE: I really enjoyed the seasons that would pass when I was a youth. Being stone cold sober and nerdy and being able to make my own fun. All the parks and playgrounds and places you could go that you could walk to, or take the bus to. There are plenty of things to do and places to see and Chicago smells a certain way, it smells delicious, throughout many different seasons. We have alleys that smell another certain way but trash isn’teverywhere. AD: You guys were on tour most of the time when you wrote Telepathic. Do you think this gave you more inspiration since you were constantly somewhere unfamiliar? AW: We just wrote a whole new record that’s coming out this year. AD: Is it coming out on 4/20? AW: Yes-another 4/20 release. We’re really consistent. And the last record was the first that was entirely written on tour. Its fun, it’s a new challenge and if you’re on tour all time that’s the only time you really can write new things. AD: How was working with Greg Ashley on recording? I always love seeing the Greg Ashley band. AW: Me too! He’s a super old friend of mine. Gris Gris was one of my favorite bands – you’ve probably seen them. It was fun recording with an old friend who knows you super well and can really push you in special ways and understand your sound and embrace it, and know how to encourage you to do your best. FW: Greg provided a very comfortable environment for us. AD: Aside from the previously stated and obvious perk of owning all the rights to your own music, why is it so important for you guys to do self-releases? AW: I mean that 80% of it is having creative control; the other 20% is really enjoying the process. You know, liking wrapping up the records and staying in touch with people, writing personal messages. We like the process and that’s what encourages us to keep doing what we do. FW: And there hasn’t really been anyone that’s approached us with a clear vision of what they want to do with us. I don’t think there’s anyone that can really handle us so we just have to put our own stuff out there. AW: Yeah, people approach us but they want us to do it their way and we aren’t even capable of even doing that. I think even if we tried really hard it wouldn’t be us anymore. We have a lot of values for the band, and rules. Weird rules, but it keeps us on track. AD: I want to know how you guys get so many endorsements! Orange amps, Eye Spy Optical, Lava Cables! AW: Well with Orange amps, their logo is a redheaded woman and a redheaded man so it worked out perfectly. Companies and organizations share a similar vision as us. No matter where you are in the world you gravitate to one another, like our friends who are here from France – we’ve played their city and now they are here. Birds of a feather flock together kind of thing. So I think that’s the case with companies that sponsor us, they’re like-minded in the way they do stuff. And we really like them, to0. Francis’s glasses, from Eye Spy, are super cool. AD: This was a perfect segue -You guys have such a unique sense of style and self, do you guys like to coordinate outfits together when you play? AW: Well, we’re going to the Grammys in a week – I’ve never looked at fashion as a challenge but that’s a pretty exciting one. You know if Fran’s going wear a Bjork dress or something. Like when the two South Park guys showed up in the J-Lo parody. FW: I want to wear fur, like just a lion cloth. AW: It’s cool because we have so many options with the way we represent ourselves visually and we like that part. FW: It’s definitely an effort. Coordinating, curate-ing, pulling the right people together, within our community, to execute the plan. Egging my sister on to really put it out. She’s really nailed it this year. AW: We have our longest video coming out this year; it’s going to be almost 7 minutes long. It’s the first time we hired a child actor to act in the video. It’s a young boy and Don Bolles, who’s the drummer from The Germs, the boy is a young Don Bolles. We shot it in LA and it’s going come out with our new record. We did it at all these different locations in LA, picked out based on how they looked and the vibe. One place was called Dog Show. It’s this weird vintage clothing store in Silver Lake and in the basement they have Stalagmites and it’s light purple and really cool. FW: Wow, I’m reliving all of that over here. AD: Did they come to you or vice versa, what was the collaboration like? AW: They would come to us and then we would propose a concept to them. So Aidan, for instance, worked at JBTV, which is a tv-show for rock music, and he said “I’d love to do a video with you guys” and I was like “Well, my friends have this psychedelic bus and we can shoot it in there.” The people who own Reggie’s have this fleet of painted buses. And we took it out on the town with all of our friends. AD: Yeah, you even got to ride a pug in a video. AW: We still have those puppets; Penelope’s so talented. We were best friends with her brother who’s the cartoon editor for Vice. I had seen her demo-reel because I’m always looking for people to do projects with us and I was like “Wow, her last name is Gazin, that’s so weird, I wonder if she knows Nick Gazin” and then it turns out they were brother and sister. So once we found out this whole sibling team up situation we fell in love. We call it the three-legged race to the alter because we are trying to get married so we’ll all be related. FW: I have a total crush on Penelope. But – In a very professional and creative way. AW: She’s an animator for Fox so since she’s done our music video she now does all the Sunday night cartoons on Fox. AD: So this is my final question and you both have to answer. You both have become pretty good role models, I’d say, in the sense of independent music and doing things your own way and sticking to your own moral and aesthetic. Alex you especially are a great female musician, but I feel like you get pigeonholed almost in that label too often. What you’re doing is impressive, gender aside. So the question is: What does being a musician in the age of millennials and computers and robots mean to you? AW: Making music in the era of robots. Well, I guess we’re doing it the same way people have for five decades, just in a new century and you just do what feels right and hope that people gravitate to it. Whether they’re androids or mirages of themselves or whatever. You just hope that reality is real and this isn’t all a simulation and what you’re doing is being appreciated by real living humans. FW: Its definitely a privilege; privilege and an honor. And maybe I’d be capable of doing other things in my life, but this is something I feel chose me and I have to offer myself to it.